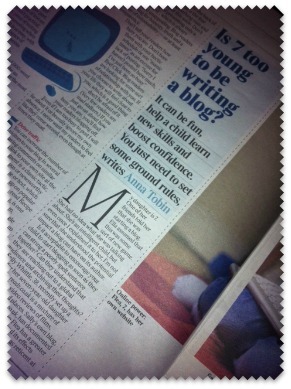 For the second time in three months, The Times newspaper has featured children’s blogging. Today’s article asks the question Is 7 too young to be writing a blog? to which we say a resounding No! – many of our best blogging friends got started at 7, and some even younger than that. The article also looks at whether you can or should make money from a child’s blog. What do you think? Is your blog the launchpad for your media empire or just something you do for fun? The fantastic bloggerstar Flea of Flea Reads, one of our top 10 child book bloggers, is pictured and interviewed, and many of our favourite kid bloggers get a mention too. Well done to you all, it’s great to see your fame spreading. Only one thing though – The Times hasn’t realised that the amazing Actually Mummy is written by the mum, not the daughter. Kudos to you, AM, you fooled The Times! Hee hee! How exciting! I’ve been in the Sun this week too! From the sublime to the ridiculous. Only problem is I can’t read it because I’m not subscribed and it’s too late to go out and buy now! Anyone got a copy?? I can scan it in for you if you like, or if you stump up a whole quid from your pocket money you can see it online. Well I guess it depends on the child. I don’t know about my kids doing it, but some kids have a natural talent and are great at this sort of thing. I’d like to be in the paper one day as of my blog. Any journalists around!!!?? ?